GoBites are the civilized travel utensils that are equally at home in the backcountry or the breakroom. GoBites are available in several models: the minimalist Uno, the snap-together Duo, the super compact Click, the fully-featured Trio, and the Quattro (the Trio but swapping out the knife for a pair of chopsticks). All models are built on the same foundation: real tools for real humans. All GoBites are made from a special, extremely durable nylon and backed by a lifetime warranty. GoBites are also BPA-free, PC-free, and phthalate-free. The GoBites Uno is also available with your company's logo, motto, mantra, or raison d'être printed on the back. E-mail sales@humangear.com for a custom quote (1000-piece minimum applies). The civilized tools for eating. 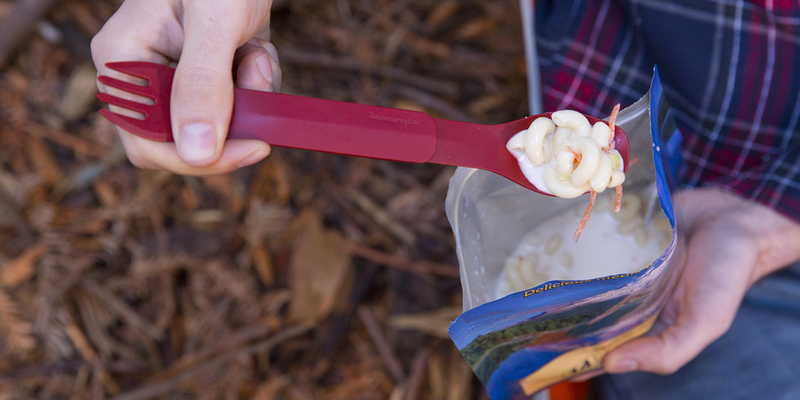 Say goodbye to silly spoons-with-tines that don't work as either a spoon or a fork. 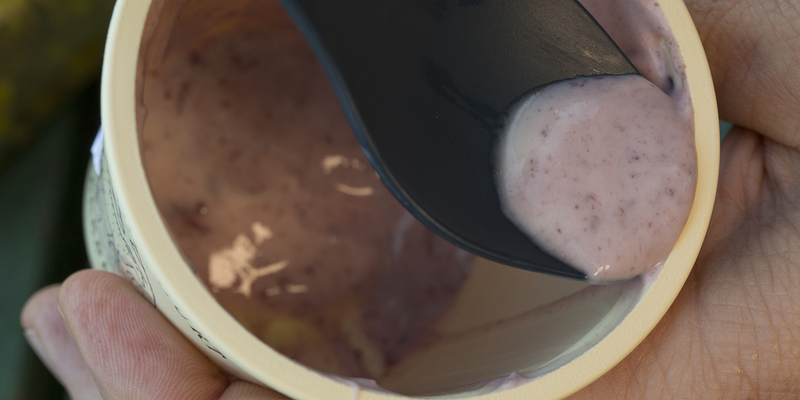 The Uno is built with smarter ends, including a spoon deep enough to slurp soup and low-curvature edges to scrape container walls. 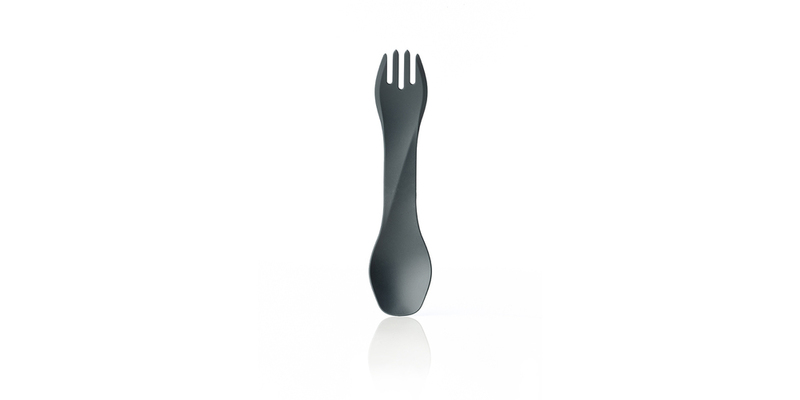 The fork has tines long enough to twirl spaghetti and "splitter tines" on each edge for easy soft-food splitting. The unique U-shaped head orientation also makes Uno much more comfortable to hold compared to competitive combination tools that poke and jab you. While the Uno is among the strongest portable utensils on the market, there’s something about a classic titanium spork that just never goes out of style. The Ti-Uno keeps the same great features as the original Uno while sporting a redesigned profile that takes advantage of the light weight and incredible strength of titanium. The GoBites Unos made from ultra-durable nylon are also available with your company's logo, motto, mantra, or raison d'être printed on the back. E-mail sales@humangear.com for a custom quote (1000-piece minimum applies). 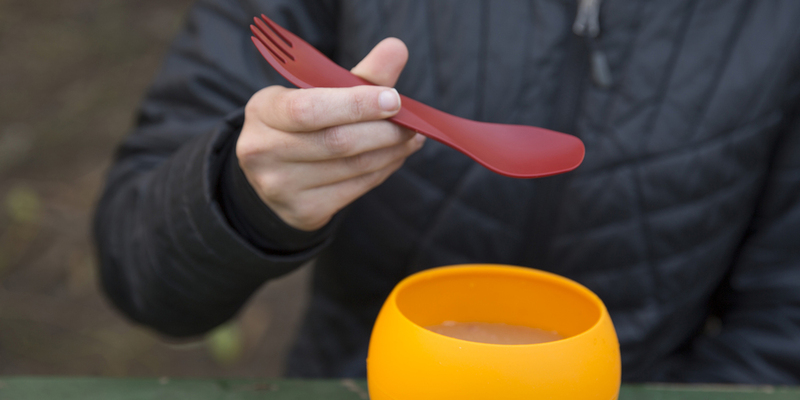 The Duo is the utensil set for people who want a real fork and a real spoon on the go. 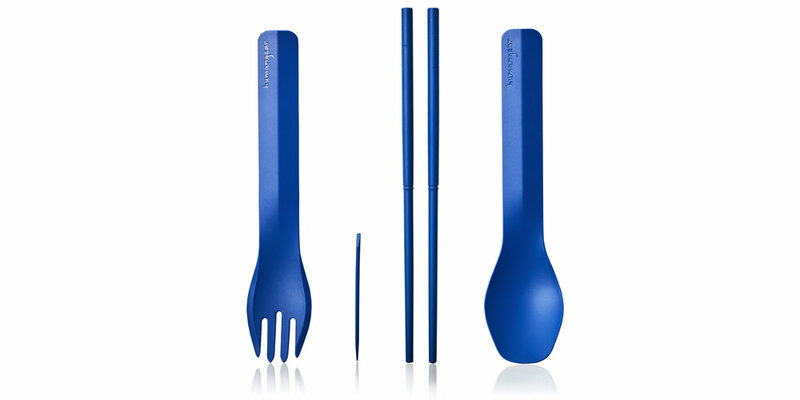 The Duo utensils are each long enough to be used separately and both are optimized for what they need to do. The tools snap together in an ultra-compact nested mode. They can also be re-connected end-to-end for eating out of rehydrated food bags, deep to-go containers, etc. The locking mechanism has been carefully designed for easy cleaning even when you're miles from the nearest dishwasher. Just like the Duo, the Click has a trick up its sleeve. While the Duo fork and spoon snap together to form an extra-long utensil, the Click utensils go in the other direction—they collapse to around half their normal size, making them the most compact members of the GoBites family. 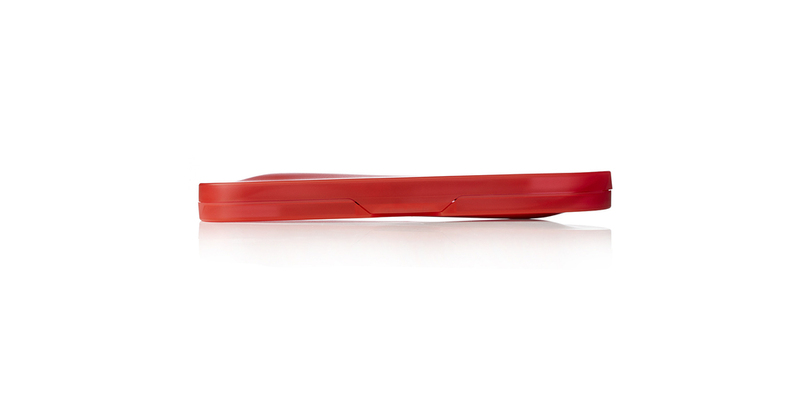 Thanks to a unique sliding-locking mechanism, the Click doesn’t sacrifice stiffness or clean-ability. 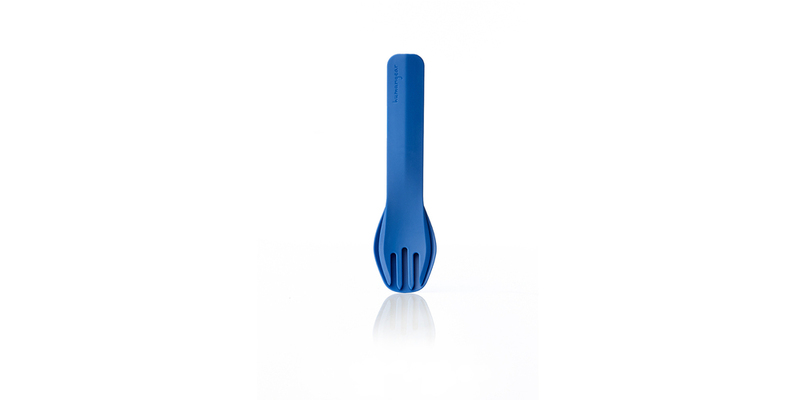 The Click utensils are made from the same ultra-durable nylon material as the rest of the GoBites. Trio's low-profile storage case keeps things clean during transport, and the lightweight, durable utensils will stand up to years of abuse. 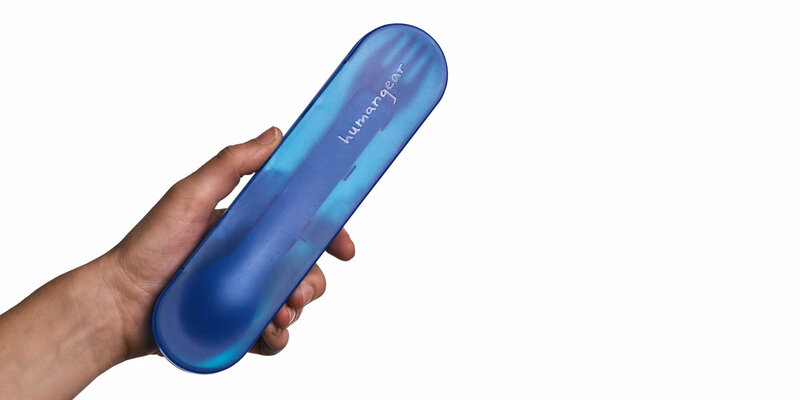 The Trio tools are designed with eating in mind--comfortable to hold but robust enough for serious eating. 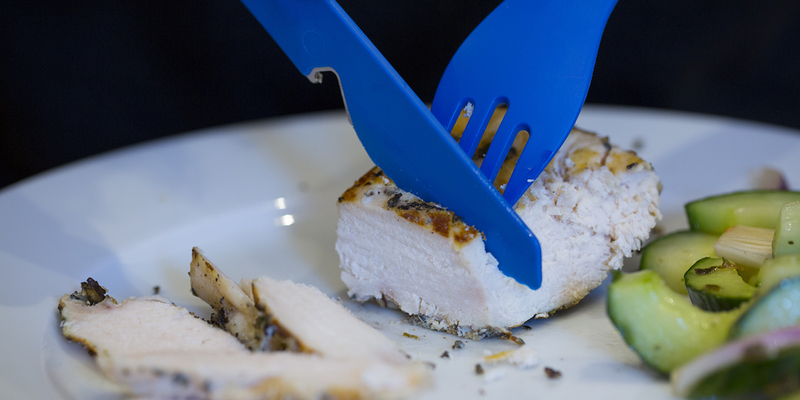 The knife blade is sharp enough to cut a piece of chicken and the fork tines are long enough to twirl spaghetti. 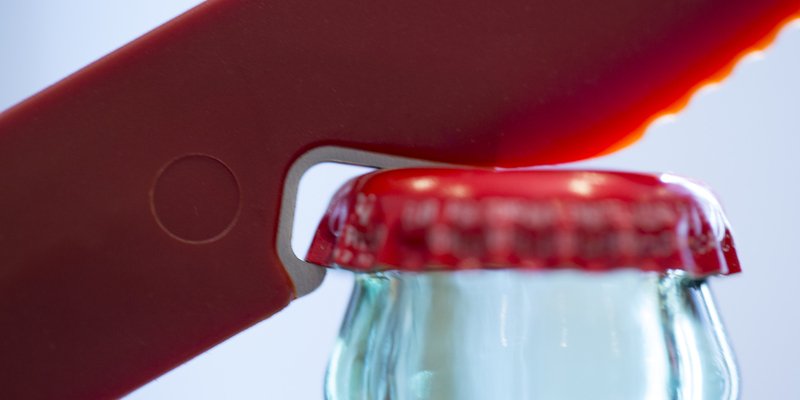 Handy touches like an included toothpick and a metal bottle opener embedded in the knife round out the set. 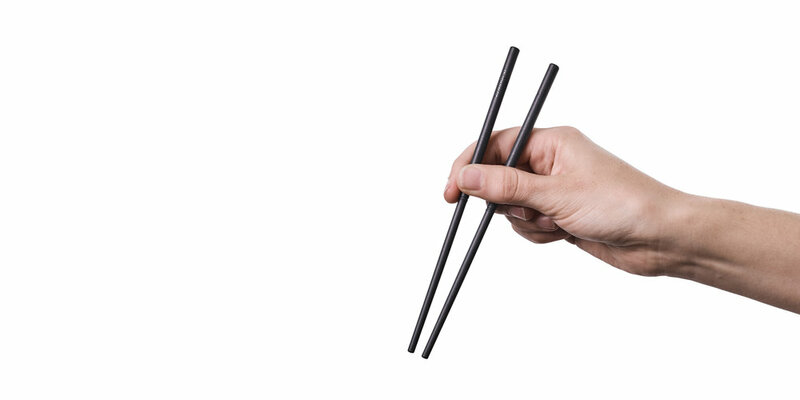 Based on the award-winning GoBites Trio, the Quattro features the same ultra-thin case but replaces the knife with a pair of travel chopsticks. The Quattro’s chopsticks lock securely into place, and the shape has been fine-tuned for the ideal balance of thickness and portability. All three GoBites have received the prestigious Red Dot Design Award, Fast Company Innovation By Design Award, Spark Design Award, International Design Excellence Award, and iF Design Award, which basically means we're not the only ones who think they're pretty awesome. GoBites are made with a special BPA-free nylon material that is amazingly-strong--strong enough to back them with a lifetime warranty. All Materials: FDA food-safe, BPA-free, PC-free, Phthalate-free"
Is the Duo the only GoBites set that allows the fork and spoon to snap together? Yes. We designed each set of utensils with their own unique set of features. 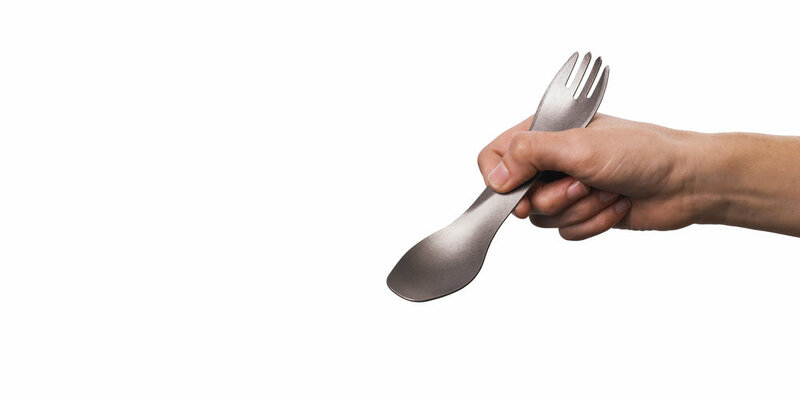 A feature unique to the Duo is that the fork and spoon can be snapped or nested together. Trio utensils do not connect together, but they've been designed slightly longer for comfortable every day use. What is the difference between the Click utensils and the Duo utensils? 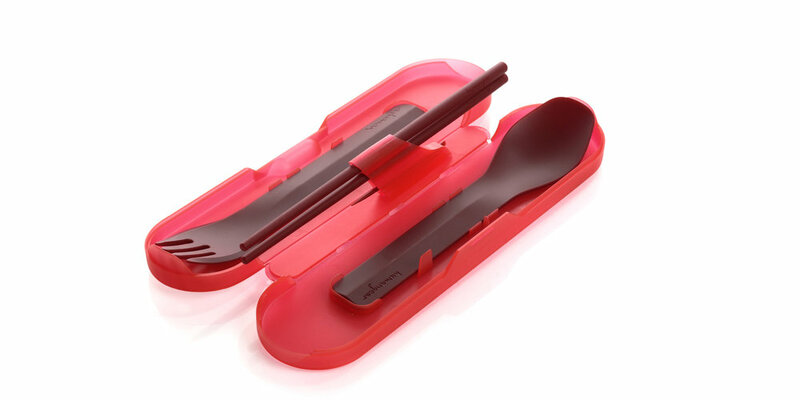 The Click utensils are designed to be the most compact in terms of height for storage while the Duo utensils are designed to snap together to give extra length if eating out of a deep container. While the Click utensils have their shorter-mode for storage, the Duo also have a storage mode—where they snap together in a nested fashion. The Click utensils can fit great in many meal-kits in their storage mode, while Duo utensils work great for backpackers eating out of rehydrated food bags. Can I bring a Trio on an airplane, specifically in my carry-on luggage? We've taken our Trios through airport security many times. TSA prohibits knives "except for plastic or round bladed butter knives." GoBite Trios fit into this exception. Will the utensils change color over time? While the GoBites' colors are very durable and won't fade or change over time, some foods may cause discoloration. Usually, this can be remedied by hand-washing in warm water, although certain ingredients will leave permanent stains. And when we say "certain ingredients," we're really talking about turmeric, which is a common ingredient and an incredibly powerful colorant (it's even used as a fabric dye). If a food is yellow, it probably has turmeric in it, so keep that in mind before using GoBites! Because turmeric and similar food colorants are so powerful, we don't cover discoloration under our lifetime warranty. What's a "Red Dot" award? The Red Dot Award is an international product design prize awarded by the Design Zentrum Nordrhein Westfalen in Essen, Germany. At hip design parties where people wear a lot of black and thick-rimmed glasses, the Red Dot is kind of a big deal (the rest of the world doesn't really care about it). 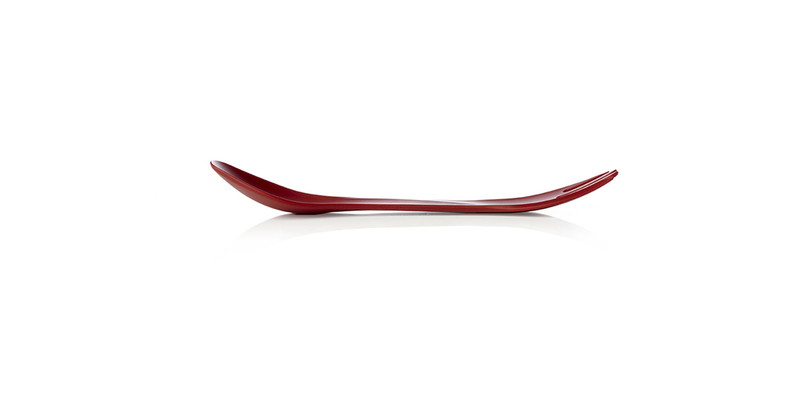 For 60 years, Red Dot has recognized the best in product design, concept design and communication design. Winning work is presented in the Red Dot Design Museum in the historical Zollverein Coal Mine Industrial Complex in Essen. The 2015 Red Dot competition had more than 4,900 entries from 56 countries. Each GoBites product (Uno, Duo, and Trio) was submitted separately and each won its own Red Dot. That's three--count 'em three!--Red Dots. Is there any design award the GoBites haven't won? Well, not yet. So far all three GoBites have won the prestigious Red Dot, IDEA, Spark, iF, and Fast Company awards for excellence in design. Most people aren't familiar with these awards, but they're the kind of thing that designers that wear all black and have fancy glasses get in a tizzy over. It was no small feat to try to reinvent something as ubiquitous and fundamental as a spoon and fork, and we're stoked that others have recognized our efforts.